The biggest producers during July were definitely the herb patch - we harvested like crazy, as the coriander does get the bit between its teeth and bolts so easily in our climate. Luckily we have a few more seedlings getting started, so we are letting it go and hopefully I will work out how to treat the seed for spice usage. The legume patch is going gangbusters also, producing enough for several meals a week and a voracious 3 year old self-serving! There is a bit of powdery mildew, which was an issue with cucumbers in this bed last season. We used a milk spray (not always effectively) then, but I have just read about a chamomile spray suggestion so might see how that goes. 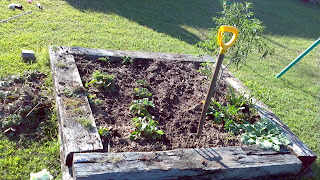 We have some new plants in the ground - Pak Choi is awesome, so I have coerced V into planting a few more here and there. As the strawberries were busy disappointing us, V has thinned them considerably and mounded them, and is going to mulch to see if they are happier. We think this bed may be a bit unhappy - about 7 months ago we used a fair percentage of paper trash in a mulch on it and, while the chilli is going great guns, everything else complains. TLC is definitely scheduled here. This little patch, however, needs no extra assistance - all by itself it has created a forest of tomatoes of all ilks, and we have already reaped a hearty crop. That tomato created some excellent raita last night! 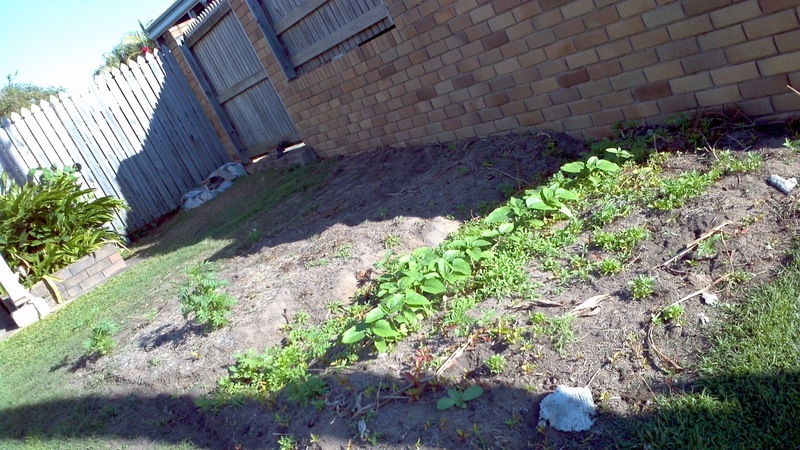 And these several million in Summer - V is trying to develop a bit more terrace out the front to define our ground a little more and stop the run off (and eventually grow a bit of a privacy border) - as an interim measure we put all of our flower trash from the front garden in here, and we are definitely going to have marigolds, whatever those flame flowers are and allysium in abundance to kickstart us. 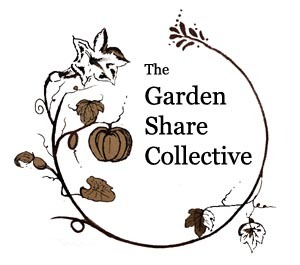 Thanks to Lizzie from Strayed from the Table for inspiring and hosting the Garden Share Collective - go and see what else everyone is doing in their gardens this month. You never plant tomatoes, am I understanding this correctly...they self seed and restart in the spring? That's kind of cool. 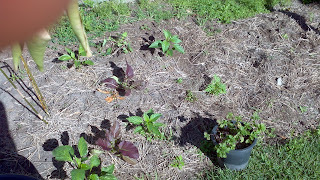 Here the winter kills them and we start over w/ new seedlings. 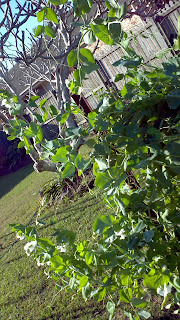 What I have learned is that my backyard is awfully shady for much of a garden. Still, we've enjoyed what we've had, and we have a new place to put in a garden next year...and it is sunny. Looking good, I can't believe you get powdery mildew all ready. We only get it during late spring and summer. I use 1 tbsp milk, 1 tsp dish-washing liquid (eco friendly of course) and water in a squirty bottle to keep powdery mildew at bay. 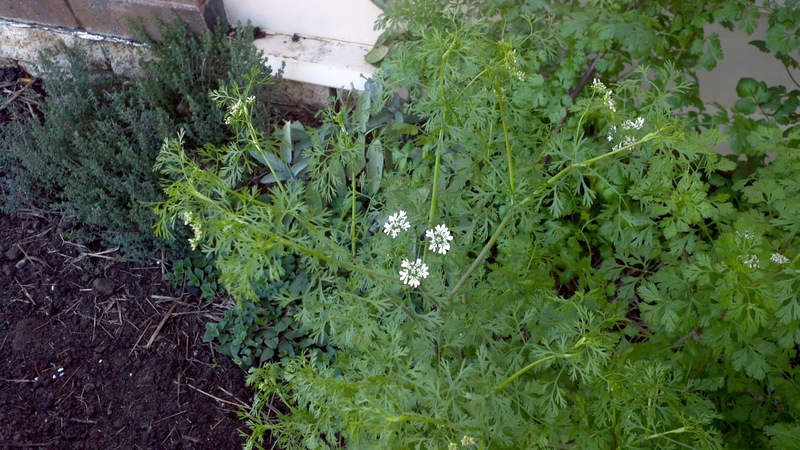 Let your coriander go to see and keep using the seed in the garden, it will slowly last longer each time as you re-sow it. 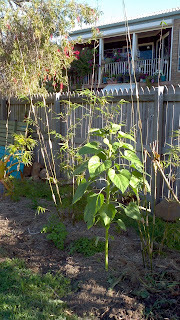 I look forward to some sunflower photos once you get blooms. You are making great progress. Looking forward to seeing an update next month. That is right Debby - we actually have more to deal with in keeping them thinned enough and only in the beds that are for "this years" tomatoes. 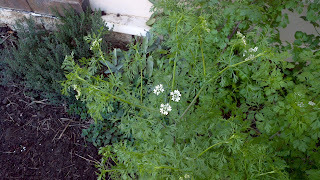 Lizzie - thanks for the coriander tip - and I will give your recipe a go on the mildew. I definitely think we will think hard about that bed's next occupants based on the last 2 seasons. Kelly - glad I inspired your baking!! 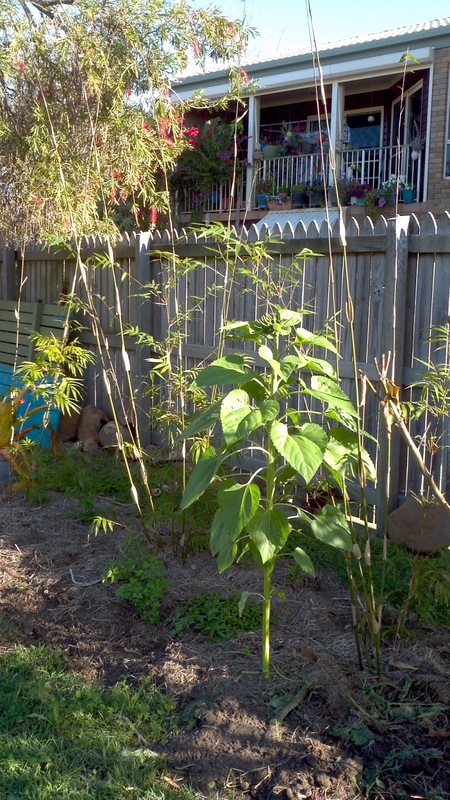 The sunflowers will definitely get photographed when they are in bloom. The privacy border... we planted ours last year, it cannot grow fast enough. I'm sure by the time it actually provides 'privacy' we'll be ready to move on from this house. Grrr. Your haul of vegies harvested is amazing! I'm refusing to buy tomatoes at the moment since they're out of season here, can't wait to grow some when it gets warm enough. Hi Jeanie,your garden is lovely, I'm so envious of your Lime tree, I had one for a year but the British winter finished it off, even in the greenhouse! Hi Jeanie, your garden is lovely, I'm so envious of your lime tree, I had one for a year once but the British winter finished it off, even in the greenhouse! it's obvious you're not here in hobart with me :-) it's wonderful seeing what you can achieve in such a mild winter as yours. thanks for the lush green inspiration. 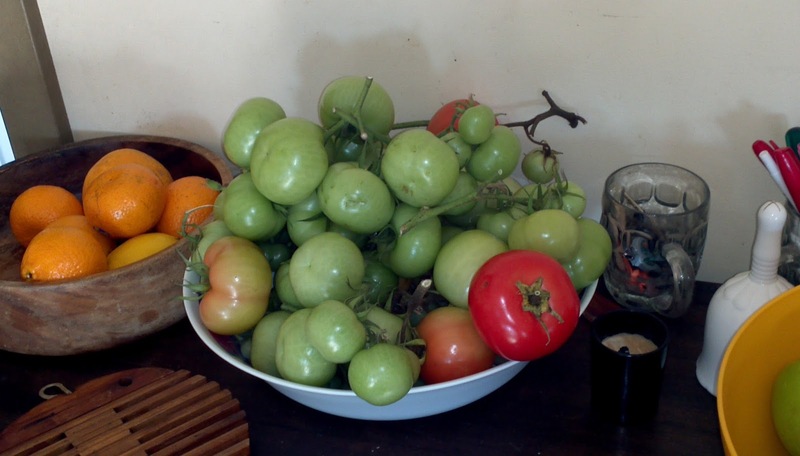 Jacqui - I hate buying tomatoes when they are so prolific at certain times of the year here! 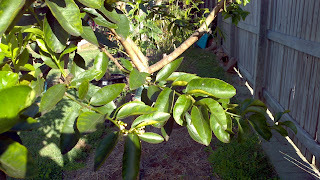 Alex - I love my lime tree also. It almost gets too much attention from me. e/dig in - I am sure the envy will be returned come midsummer!! Okay. I've discovered two jars of it in my cupboard. I'm not sure why. One is open. One is not. I will ask you. What does one DO with corriander. Thank you. I saw your picture of tomatoes on facebook, sighed and thought, Jeanie really DOES live in paradise! This one here does not tend to buy coriander in jars (no need, obviously) but add some to stir fries and see how it zings. Coriander Seed is also used as a spice in many dishes - when you come over, I will definitely cook you something to show it all off!!! Oh, and to use tomatoes AND coriander, add to a minced onion and you have awesome raita. My garden was awful this year. Yours looks awesome! 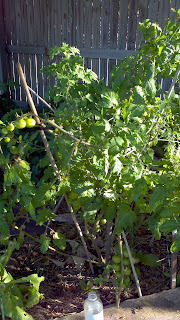 Your garden is looking great especially the huge tomato crop. 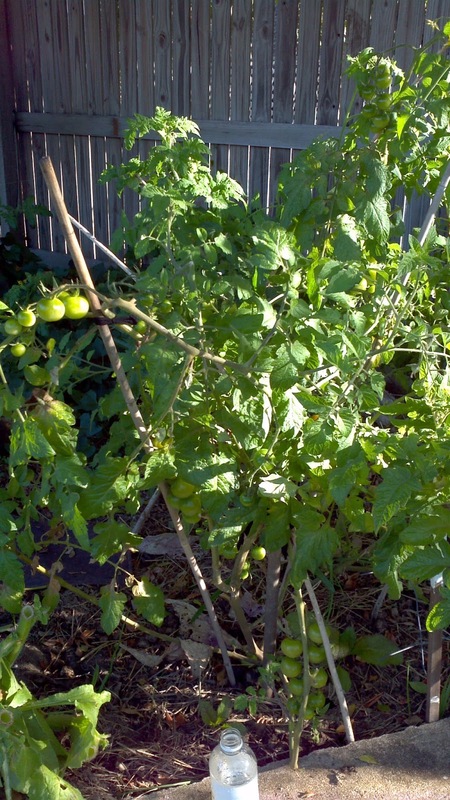 I cant wait to get some new tomatoes planted in our garden, it is great that yours self seed. Also looking forward to how you go with the coriander seed, I really like using it in cooking so it would be fun to compare the taste of it fresh compared to the ones you get from the markets. What a great garden. I love your beds, the tomatoes are divine and your legumes are so healthy. 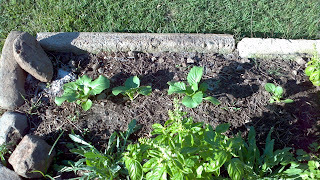 The baby bok choi is magnificent and you have produced a wonderful garden. 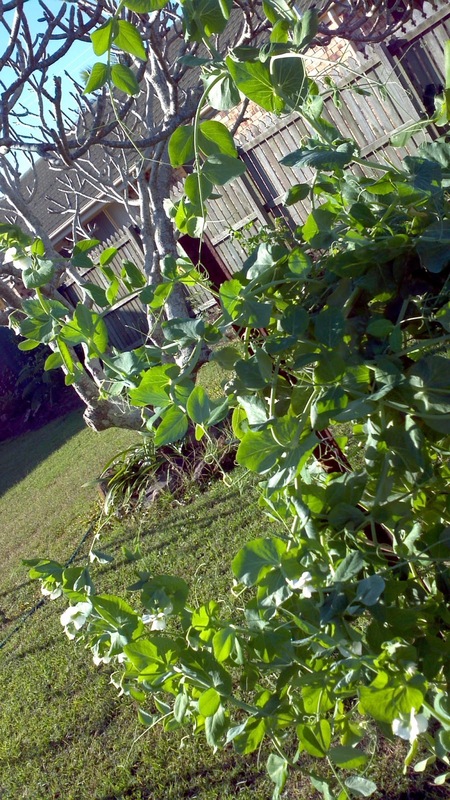 You have a lush lime tree there! A bumper crop of limes sounds wonderful! Your garden and edible goodies are fab, thanks for letting us have a look. Here is to next year then, Emma? Louie - I will definitely update on the coriander seed experiment. Andrea - I love to garden (well, at the moment, I love to boss V gardening lol) and I LOVE to eat - the two are remarkable when they intertwine! !